How was your week? Yeah, mine too. Well, now that we got this out of the way. "Rural" is a puzzling category, and one that seems to be defined differently, yet automatically, by different people. "Rural" is also a cultural identity, with "Rural" having connotations of simplicity and honesty for some, and ignorance and lack of sophistication for others. Quite a lot to pin on a vague geographical designation. One that is often at odds with the reality of American life: its been over fifty years since the Interstate Freeway was begin, and even longer since rural electrification. The percent of the population that are primarily involved in agriculture has declined to a tiny percentage of the population, and even in the "heartland" they are a minority of jobs. That being said, the United States Department of Agriculture has a designation for a more isolated area than just the garden variety "rural" area. 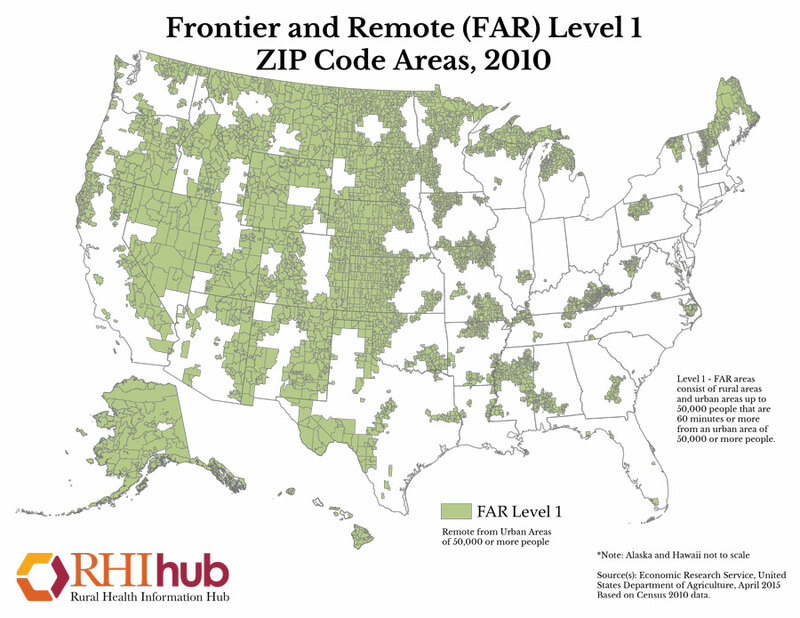 These areas are designated "Frontier and Remote", which helpfully abbreviates to "FAR". There are four levels of FAR, with Far Level 1 being the least remote, and Far Level 4 being the most remote. There is a relatively simple definition of what constitutes Far Level 1: if an area (defined as a ZIP Code) is more than an hour from a metro area of 50,000 people, it is FAR Level 1. FAR Level 2 is defined as being more than 45 minutes from a city of 25,000 people, FAR Level 3 is 30 minutes from a city of 10,000 people, and FAR Level 4 is 15 minutes distant from a city of 2500 people. The way they arrive at these designations is a bit more complicated, involving dividing the nation into a grid, estimating population, and then using an algorithm to determine travel time. Its not totally objective, and it seems arbitrary, but there was an original point behind it, given rather starkly: these were travel times needed to reach a hospital capable of dealing with a coronary emergency or a cesarean delivery. As it is, the measurement of "FAR" shows a gradation in what type of services a person might be able to access. A person in FAR Level 1, for example, has to make an hour journey for most health care, for shopping for appliances or electronics, or to attend higher education. At FAR Level 4, common every day items like food or clothing might be difficult to obtain. Although not precise, the maps give a basic functional definition of what it means to be remote: what level of services and amenities would people have access to? At Level 1, FAR areas take up about 50% of the country's area, and account for around 7% of its population. The FAR areas are naturally concentrated in the West, (and especially Alaska!) In the West, the non-FAR areas are islands, while in the East, starting around the plains states, the pattern reverses itself. In the east, only a few areas, such such as Northern New England, parts of Michigan and Minnesota, and pockets along the Appalachian Mountains and the East Coast. Significantly, many states that are sometimes seen as "rural", such as Ohio, have no FAR territory at all. I like this map, overall, because it operationalizes and defines an issue that has too often been used as nothing but a cultural shibboleth. It also, is of course, good for people who might be planning an extended trip into these areas to estimate what type of services they will have access to. And also, its guaranteed that showing this map to someone from Indiana will automatically elicit a reaction of learning just how few traffic lights their town has!